Home > Understanding > How is a Brain Aneurysm Diagnosed? Years of scientific research have confirmed many of the major risk factors for brain aneurysms, which can rupture and cause a bleeding stroke. Despite the absence of government recommendations for expensive screening procedures, it is strongly recommended that people at high risk of rupture be screened. It is urged that patients who have family members with aneurysms, or who know they harbor small aneurysms of their own, to stop smoking to reduce the risk of enlargement and/or the development of the aneurysm. In addition, screening with MR angiography or CT angiography is strongly advised for anyone who has two first-degree family members who have experienced a ruptured aneurysm. Screening is 90 percent effective for aneurysms of 2 millimeters and 100 percent effective for aneurysms larger than 5 millimeters, with the risk of false positives extremely low. Brain aneurysms may run in families. If brain aneurysms run in your family, you are more at risk of having a brain aneurysm than the average 3%. Your risk depends on how many relatives have been affected, and how many closely related to you there are. If you have two or more affected first-degree relatives, your risk of having a brain aneurysm is 8% (8 in 100), which is higher than average (3 in 100). We do not know the exact risk of you having a bleed from an aneurysm in your lifetime, but it is higher the more first-degree relatives you have affected. How often is screening recommended? Serial screening MRAs should be completed every 10 YEARS beginning at the next 10th interval birthday (i.e. 20th, 30th, etc). If family history changes from 1 to 2 or more first-degree relatives, then screening frequency should be increased to every 5 years. Serial screening MRAs should be completed every 5 YEARS beginning at the next 5th interval birthday (i.e. 25th, 30th, 35th, etc). If you feel you are a candidate for screening, contact your physician to proceed. Aneurysms rupture at about 1-2% per year but varies with the size, location and history of previous aneurysm rupture. Unfortunately, most aneurysms present because they have ruptured. Occasionally, large aneurysms can present with vision changes, pain above and behind the eye, nerve paralysis, localized headache, neck pain, nausea and vomiting, or other neurological symptoms. If you have any of these symptoms possibly related to a ruptured aneurysm, you will undergo a test or series of tests to determine if you have had bleeding into the space between your brain and surrounding tissues (subarachnoid hemorrhage) or another type of stroke. If bleeding has occurred, then your emergency care team will determine if a ruptured aneurysm is the cause. Fortunately, an increasing number of aneurysms are found prior to rupturing because CT (computed tomography) and MRI (magnetic resonance imaging) are now used commonly to assess patients with these complaints. These are noninvasive methods a radiologist uses to look at the blood vessels in the head. A physician will determine which is the better option for each patient. MR does not involve radiation or contrast risks, while a CT produces better resolution and is better for operative planning. Patients suspected of having a ruptured aneurysm typically undergo a CT scan of the head and a CT angiogram, which shows subarachnoid hermorrhage and the aneurysm. If you have symptoms of an unruptured brain aneurysm – such as pain behind the eye, changes in vision, and paralysis on one side of the face – you will likely undergo the same tests. 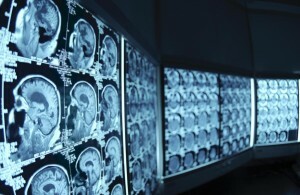 Computerized tomography (CT) – A CT scan, a specialized X-ray exam, is usually the first test used to determine if you have bleeding in the brain. The test produces images that are two-dimensional “slices” of the brain. With this test, you may also receive an injection of a dye that makes it easier to observe blood flow in the brain and may indicate the site of a ruptured aneurysm. This variation of the test is called CT angiography. Cerebrospinal fluid test – If you’ve had a subarachnoid hemorrhage, there will mostly likely be red blood cells in the fluid surrounding your brain and spine (cerebrospinal fluid). Your doctor will order a test of the cerebrospinal fluid if you have symptoms of a ruptured aneurysm but a CT scan hasn’t shown evidence of bleeding. The procedure to draw cerebrospinal fluid from your spine with a needle is called a lumbar puncture or spinal tap. Magnetic resonance imaging (MRI) – An MRI uses a magnetic field and radio waves to create detailed images of the brain, either two-dimensional slices or three-dimensional images. The use of a dye, MRI angiography, can enhance images of blood vessels and the site of a ruptured aneurysm. This imaging test may provide a clearer picture than a CT scan. Cerebral angiogram, or cerebral arteriogram – During this procedure, your doctor inserts a thin, flexible tube (catheter) into a large artery – usually in your groin – and threads it past your heart to the arteries in your brain. A special dye injected into the catheter travels to arteries throughout your brain. A series of X-ray images can then reveal details about the conditions of your arteries and the site of a ruptured aneurysm. This test is more invasive than others and is usually used when other diagnostic tests don’t provide enough information. Magnetic resonance angiogram (MRA) – A magnetic resonance angiogram (MRA) is a type of magnetic resonance imaging (MRI) scan that uses a magnetic field and pulses of radio wave energy to provide pictures of blood vessels inside the body. In many cases MRA can provide information that can’t be obtained from an X-ray, ultrasound, or computed tomography (CT) scan. MRA can find problems with the blood vessels that may be causing reduced blood flow. With MRA, both the blood flow and the condition of the blood vessel walls can be seen. The test is often used to look at the blood vessels that go to the brain, kidneys, and legs. Information from an MRA can be saved and stored on a computer for further study. Photographs of selected views can also be made. During MRA, the area of the body being studied is placed inside an MRI machine. Contrast material is often used during MRA to make blood vessels show up more clearly.